Cornish Daisy design and make a quirky stylish range of high quality dribble bibs and blankets for babies and toddlers blankets and clothes on an eco-friendly smallholding in West Cornwall. 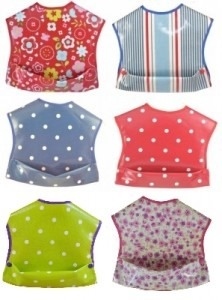 Cornish Daisy dribble bibs are soft and comfortable for your baby. The front surface is made from cotton interlock fabric and the backing from high quality polyester fleece. The unique dribble bib design is coupled with a resin press fastening. This ensures that the bib is self adjusting for children from birth to two years old (approximately). The highly absorbent cotton front surface soaks up your baby’s dribble. The fleece backing to the dribble bib ensures that any residual moisture is drawn away from your baby’s delicate skin. Cornish Daisy Dribble Bibs are available in a wide variety of designs and the colours and patterns change regularly as exciting new fabrics become available. All dribble bib and blanket manufacturing is carried out on our small holding in Cornwall and we strive to source only UK manufactured fabrics for our dribble bibs wherever possible to lower the environmental impact of our bibs.